These revelations — along with the systemic failures in the military’s aviation maintenance system that led to the loss — are outlined in a Marine Corps investigation into last summer’s crash that was obtained by Defense News and Military Times. After coming off the second propeller, the cracked blade sliced through the port side of the aircraft and lodged into the interior of the right side of the plane. Energy reverberated through the aircraft, causing the third propeller to detach and slam into the starboard horizontal stabilizer, knocking most of the stabilizer off, investigators wrote. “This impact caused the skin of the aircraft to separate along the starboard side,” the investigation states. Everyone on board — the pilots, the aircrew and the passengers — were killed. They are Marine Cpl. Daniel Baldassare, Cpl. Collin Schaaff, Sgt. Dietrich Schmieman, Sgt. Joseph Murray, Sgt. Chad Jenson, Sgt. Owen Lennon, Sgt. Julian Kevianne, Navy Petty Officer 2nd Class Ryan Lohrey, Marine Sgt. Talon Leach, Staff Sgt. Robert Cox, Staff Sgt. William Kundrat, Staff Sgt. Joshua Snowden, Gunnery Sgt. Brendan Johnson, Gunnery Sgt. Mark Hopkins, Capt. Sean Elliott and Maj. Caine Goyette. The 4th Marine Air Wing probe suggests they did not suffer for long, nor could they do anything as the 25-year-old plane came apart. Debris was scattered for miles. Families and friends are gathering in Itta Bena, Mississippi, about six miles from the crash site, to unveil a monument to the victims. Yanky 72 was transferring troops, ammo and vehicles for 2nd Marine Raider Battalion, and all weapons were found except for a Glock-19 pistol, according to the report. The crash investigation suggests deficient blades were sent out to Navy and Marine Corps aircraft for years. “Negligent practices, poor procedural compliance, lack of adherence to publications, an ineffective (quality control and quality assurance) program at (Warner Robins), and insufficient oversight by the (U.S. Navy) resulted in deficient blades being released to the fleet for use on Navy and Marine Corps aircraft from before 2011 up until the recent blade overhaul suspension,” the report states. How did a corroded KC-130T blade escape the Air Force's quality control apparatus? In response to the crash and a closer inspection of the Warner Robins facility, the Air Force halted blade maintenance operations on Sept. 2, 2017. All Navy and Marine Corps C-130s were grounded after the crash, and all 43 aircraft have or will receive new propellers, according to officials. Air Force Materiel Command spokeswoman Wendy Varhegyi said a review of more than 1,300 C-130H propeller blades has found three with the type of minor corrosion that is consistent with any fielded blade. 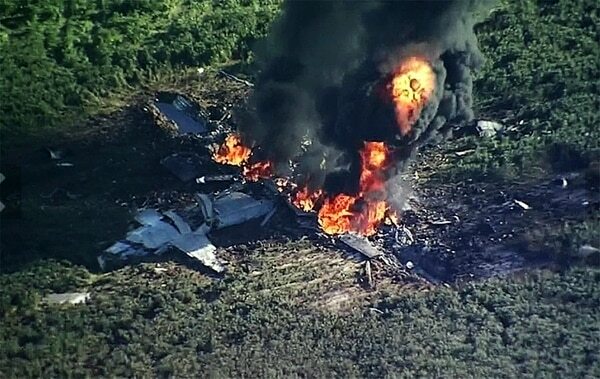 A propeller problem was discovered after the fleet was grounded following the July 10 Marine Reserve KC-130T crash that killed 16 troops. “Out of an abundance of caution, every potentially affected propeller was slated to be overhauled and replaced,” Kuntz said. New propellers are being installed on the fleet and old ones will start being overhauled again once the Warner Robins reforms are in place, he said. Kuntz said the Navy had not assessed whether those removed propellers suffered the same disrepair that brought down Yanky 72. 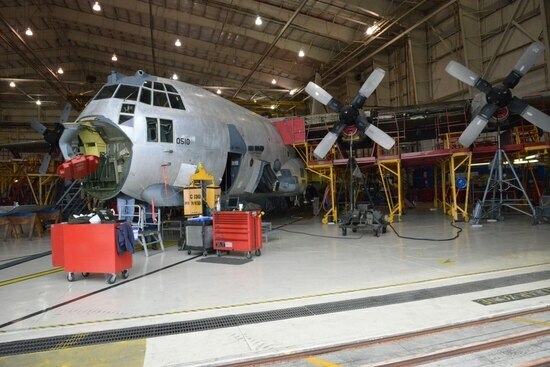 Warner Robins Air Logistics Complex overhauled propellers for all variants of Air Force, Navy and Marine Corps C-130 Hercules, which are manufactured by Lockheed Martin using propeller blades by United Technologies Corp. The complex has averaged 400 C-130 props per year over the past decade, with Navy props comprising five percent of that workload, according to the report. The U.S. Air Force says it wants to add 1,200 jobs within the next year at its sprawling base in central Georgia. 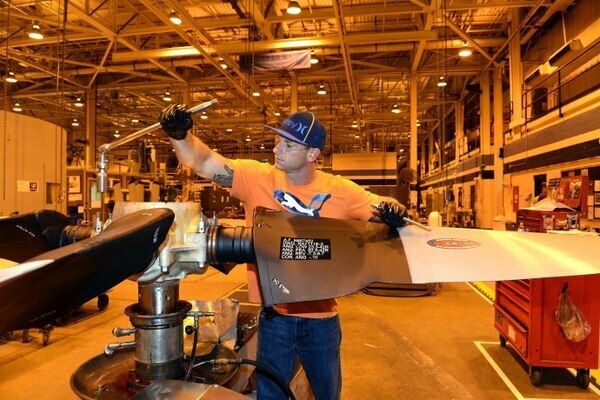 The work is performed by civilian employees, who overhaul propellers after 5,000 hours. The corroded propeller blade that set off the mishap last went through overhaul in 2011, according to the investigation. Although processes existed for the civilian maintainers at Warner Robins to identify and fix such corrosion, investigators found no evidence that such measures were taken in 2011. “The intergranular radial crack in blade four, which ultimately was the root cause of this catastrophic mishap, developed and matured from corrosion pitting and (intergranular cracking) that was not removed during the last blade overhaul,” the investigation states. It was not the only deteriorated blade flying with Yanky 72 that day, according to the investigation. Twelve of the 16 blades on the four-propeller plane suffered from corrosion that was present the last time they each passed through Warner Robins, “proving that over the course of a number of years…[Warner Robins] failed to detect, remove and repair corrosion infected blades they purported to have overhauled,” the investigation states. One prop blade on Yanky 72 was supposed to have been removed from service by Warner Robins workers during its last overhaul in 2015, the report states. The investigation found that anodize coating was applied to the areas of the fatal propeller blade affected by corrosion pitting, even though that protective coating is meant to be applied only after corrosion has been removed from the blade, according to the investigation. Other corrosion-preventing material required by the Navy at the time — such as permatreat coating or epoxy primer — was also not applied, the report states. And because Warner Robins destroyed its work documents after two years, the investigation could not prove whether the organization had properly tested the blade for corrosion damage using a Navy-specific processes involving a borescope or eddy current inspection that would help detect flaws beneath the surface. 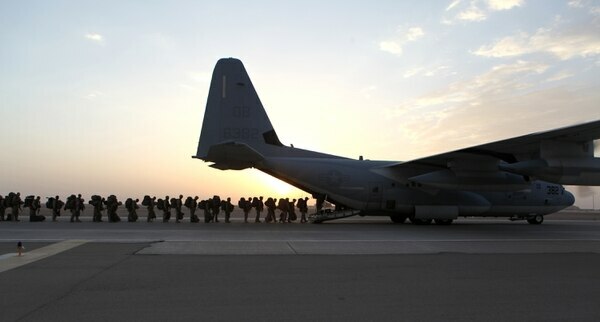 “Since only approximately five percent of C-130 blades are a Navy/Marine Corps asset, it is uncertain whether sufficient steps are embedded in the work flow process to ensure that Navy/Marine Corps critical requirements, such as borescope inspections and permatreat/epoxy primer coatings, are satisfied,” the report states. A Navy team visited Warner Robins for a two-day process audit in August 2017 and noted several problems, many of which could result in Navy and Marine Corps components being separated from their paperwork — raising the potential that Navy-specific practices were not followed.. They found that propeller work control documents are color-coded for each service and aircraft, but that many of the documents did not reflect the proper color paper for each service, and that such records weren’t accompanying the blades through the overhaul process. Another summary included in the report’s supplementals states that Warner Robins employees have trouble identifying whether a given prop is for an Air Force or Navy C-130, even though work documents say, “AIR FORCE BLADE,” “NAVY BLADE” or “P-3 BLADE” in large letters, they wrote. “This could be an effort to limit liability to [Warner Robins] by attempting to find a causal factor that moves the blame away from this institution for missing the corrosion pits and intergranular cracking at the last propeller overhaul,” a visit summary states. Warner Robins depot staff use electronic copies of instructions with specific guidance for each job, known as “pubs," throughout the shop. Yet while maintainers had laptops on hand with the required instructions up, it was “never referenced during process execution or during pre or post-process discussions,” according to a summary of the two-day Navy process audit conducted last summer. “Some technicians relied strongly on their memory, it appeared, rather than a steady referral back to the instructions,” auditors wrote. One technician cited the wrong technical information to the audit team when queried and auditors found an outdated publication being used on one job. The Navy’s audit team also took issue with the facility’s quality assurance program, which involves random checks of artisan work. When it occurs, quality assurance involved the artisan checking their own work and then another person with no formal quality assurance training acting as a second set of eyes. If an artisan does a bad job, there are no real consequences, according to the Navy auditors. “The Artisan may have to suffer a little bit of embarrassment, but that Artisan then gets to go back through training; which is essentially a vacation/break away from his job,” they wrote. Earlier this year, a Marine lieutenant colonel leading the crash investigation for the 4th Marine Air Wing whose name is redacted in the report took his team to Warner Robins at the invitation of the complex’s commander. The investigative team saw no protocols to ensure work orders accompanied their blades through the process. This allowed uncertainty to enter the process, the investigator wrote. “If technicians were not carefully reading the work control documents, they could misconstrue the blade process they were required to perform due to the wrong color coding,” the memorandum states. Kubinec, the complex’s commander, said it will start overhauling blades again by next year. An independent review team comprised of Navy and Air Force officials, as well as industry partners, are reforming the prop blade overhaul process at Warner Robins, which will primarily entail creating a uniform approach to overhauling Navy and Air Force blades, the report states. But the independent review team has no chain of command, which raises questions about implementation, reporting requirements or final consensus, the Marine investigator wrote earlier this year. As of the memo’s writing, the Navy had not outlined an evaluation process to ensure quality propellers are returned to the fleet, the investigator wrote. The investigator also said that Warner Robins had “failed to show significant process improvements” noted by the Navy’s initial August 2017 audit. “This is concerning considering the same procedural and quality control errors that allowed the (blade) and countless other propellers to erroneously enter the fleet could still exist,” the investigator wrote. Although the investigation found several deficiencies in Warner Robins’ blade overhaul processes, it also lays blame at the feet of the Navy for not carrying out its oversight responsibilities. Under the terms of a 2009 agreement between the Navy and Air Force, which sets up the complex’s obligations for C-130 propeller overhauls for other services, the Navy should have conducted periodic audits of the Warner Robins’ work. Neither the Navy nor the Air Force “is able to produce any evidence that either a quality audit or investigation has ever occurred, nor requested” since the agreement’s inception, the report states. “Had the (quality assurance) provisions of the (Navy-Air Force agreement) been properly managed and implemented by the Navy via conducting systematic and routine quality audits, numerous deficiencies within the blade overhaul process should have been identified which could have prevented the accident," investigators wrote. 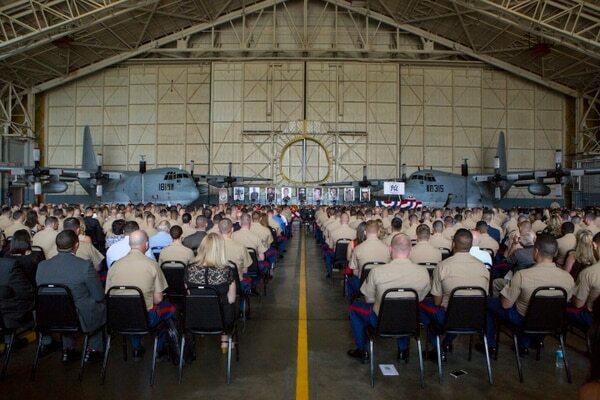 While a Naval Air Systems Command, or NAVAIR, liaison is stationed at the Warner Robins facility, the complex’s senior leadership “had no memory or record of USN visits to (Warner Robins) historically,” the Marine investigator wrote in April’s memorandum. “It was also clear from discussions during our site visit that proper procedures were not utilized to coordinate inspections, audits or visits,” the officer wrote. The Air Force-Navy agreement for prop maintenance lists several oversight options, but the only office at the complex who understood the contract between the services was the business branch. The investigation also uncovered a multitude of lapses during squadron-level maintenance performed by VMGR-452, although it could not determine whether those oversights had contributed to the crash. If an aircraft sits in maintenance for more than 56 days without being run or without its blades being manually rotated, intermediate-level maintainers must perform an eddy current inspection to check for cracks beneath the surface of the propeller blade. During such an inspection, a magnetized metal probe is moved across the surface of the blade to detect anomalies. On April 26, 2017, the mishap aircraft had sat idle for 56 days, which should have triggered an inspection, but an eddy current analysis was never performed, according to the report. The powerline chief from VMGR-452’s powerline division believed the 700-hour engine inspection conducted at the time would satisfy the requirement, because the propeller blades had been rotated at least three times. But the Marine Corps investigation found the squadron did not have the documentation necessary to verify whether the conditions of the 56-day rule had been met. That powerline chief, a staff sergeant whose name is redacted in the report, told investigators that the number of times a prop blade must rotate in order to ensure all engine turbine blades have been inspected is “until I feel comfortable,” the report states. Still, the investigation states that “it cannot be quantifiably determined” that operational or intermediate-level maintenance inspections or actions could have detected the blade conditions that led to the crash. “Even if the unit had conducted the required off-wing eddy current inner taper bore inspection in April 2017, it cannot be concluded with any reasonable degree of certainty that the radial crack would or would not have been detected as the growth rate for a radial crack is unknowable,” investigators wrote. The report also questions about the professionalism and competence of VMGR-452’s maintenance team in general. During a visit to VMGR-452 in March, several investigators nearly slipped on a large area of the hangar deck that “was saturated with oil or hydraulic fluid,” according to a summary of the visit included in the report’s supplementals. Such a discrepancy “builds concern for how they conduct maintenance safely on a daily basis,” the summary states. In response, the Marine Corps took action in order to improve corrosion prevention and general maintenance practices at VMGR-452. Brig. Gen. Bradley James, commander of the 4th Marine Air Wing, said “everyone is looking to what they can do to improve” in the wake of the crash. “Anyone around this process is absolutely horrified,” he said. 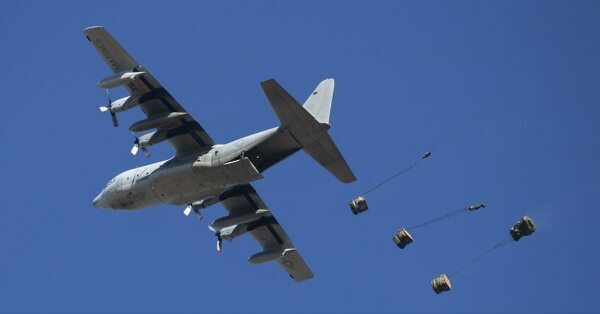 Last summer’s crash will likely provide a grim and final coda for the KC-130T, which is slated to become an aircraft of the past for the Marine Corps. VMGR-452 is the only squadron still flying the T model as the rest of the force transitions to a modern J variant, according to James.